This review of the journey of Rosetta’s lander Philae, now dead on the surface of Comet 67P/C-G, includes information about the science’s team upcoming last effort to locate the lander. They intend to try to re-establish communications with the lander, but do not have much expectations that it is able to function. With time running out as Comet 67P/C-G moves away from the Sun, the Rosetta engineering team is going to try one more time to contact the lander Philae. The lander team are going to try another method to trigger a reponse from Philae: on 10 January they will send a command, via Rosetta, to attempt to make Philae’s momentum wheel switch on. “Time is running out, so we want to explore all possibilities,” says Stephan Ulamec, Philae lander manager at DLR. Philae’s momentum wheel ensured that it was stable during its descent from the orbiter on 12 November, 2014. If the command is successfully received and executed, the hope is that it might shift the lander’s position.”At best, the spacecraft might shake dust from its solar panels and better align itself with the Sun,” explains Philae technical manager Koen Geurts at DLR’s lander control centre. They also believe that one of the lander’s two transmitters and one of its two receivers are broken, which makes communications difficult at best. The scientists and engineers operating Rosetta have begun planning the mission’s spectacular finale, when they will spend several months orbiting within six miles of Comet 67P/C-G’s surface before very gently crashing the spacecraft on the surface. Because of many factors, Rosetta is not expected to survive the impact, no matter how gently it lands. However, the data it will send back in its final months as it makes tighter and tighter orbits should be well worthwhile. In related news, the science team has released an animation, posted below the fold, of their re-creation of the flight and crash landing of Philae on the comet. For those who want to read some interesting science papers, on Friday the journal Astronomy & Astrophysics published a special issue devoted to the results from Rosetta and Philae. The issue includes 46 papers, many of which are open access and thus available at no cost to the general public. Many were published previously and include their press releases. These earlier results have already been posted here at BtB, but now they the results are gathered together in one place. The magic of engineering: Using the seven images Philae snapped as it made its descent to Comet 67P/C-G, engineers have created a short movie simulating what the surface would have looked like as the lander descended. I have posted the video below the fold. Be sure to go to the link above however to find out how this was done. The story is fascinating because the lander’s behavior and response to commands has been quite puzzling. They have had about a half dozen short contacts of varying length, all interspersed with a lot of intermittencies. At the moment they have not entirely given up on Philae, since based on what they know of its location and condition it could remain functional through the end of this year. They also recognize that re-establishing contact is becoming increasingly unlikely. The big hope is that once the comet moves farther away from the sun and becomes less active, they will be able to move Rosetta in closer, when the chances of contact will improve. The Rosetta science team today released all data obtained by the mission through Philae’s landing on November 14. If you go here you can browse all the images the spacecraft’s high resolution camera took during that time period. You might even discover something the project scientists missed in their first perusal. Engineers on the Rosetta team are struggling to figure out why they cannot get a solid communications lock with their Philae lander, and have come up with several explanations. Another separate issue under analysis is that one of the two transmission units of the lander appears not to be working properly, in addition to the fact that one of the two receiving units is damaged. Philae is programmed to switch periodically back and forth between these two transmission units, and after tests on the ground reference model, the team has sent a command to the lander to make it work with just one transmitter. As Philae is able to receive and accept commands of this kind in the “blind”, it should execute it as soon as it is supplied with solar energy during the comet’s day. They have heard from Philae since July 9. Because of comet activity they have had to pull Rosetta back away from the nucleus to protect it, and are now focusing its primary activity on observations, not communications with Philae. They will continue to try to bring Philae back to full functioning life, but the priority is now the comet. On July 9 Philae successfully transmitted data to Rosetta for the first time in more than two weeks. Although the connection failed repeatedly after that, it remained completely stable for those 12 minutes. “This sign of life from Philae proves to us that at least one of the lander’s communication units remains operational and receives our commands,” said Koen Geurts, a member of the lander control team at DLR Cologne. The mood had been mixed over the last few days; Philae had not communicated with the team in the DLR Lander Control Center (LCC) since 24 June 2015. After an initial test command to turn on the power to CONSERT on 5 July 2015, the lander did not respond. 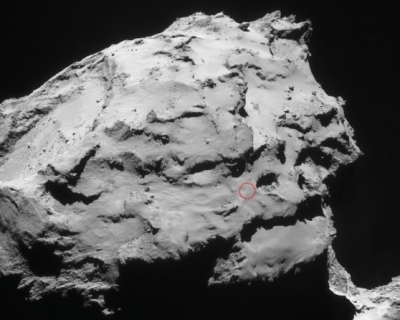 Philae’s team began to wonder if the lander had survived on Comet 67P/Churyumov-Gerasimenko. 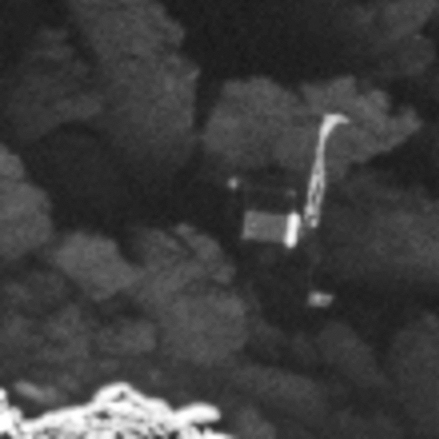 The intermittent nature of Philae’s attempts at communication are puzzling. Normally, they either would have communications or they would not. For good communications to break off like this repeatedly is puzzling. It is almost as if there is a loose wire causing communications to go on and off, which seems an unlikely explanation for this problem. The European Space Agency has accepted the proposal of the Rosetta science team to extend the mission until September 2016, when they will then consider attempting a landing on the surface of Comet 67P/C-G.
Philae today sent another 2 minutes worth of information to Rosetta. The downlink was stable; the two contacts received by Rosetta lasted two minutes each. Both delivered numerous packets of lander housekeeping and status data, 185 in total, which are still being analysed at the time of this writing. No science data were anticipated or received. Engineers have begun shifting Rosetta’s trajectory paralleling Comet 67P/C-G in order to maximize communications with the lander Philae. Commands to adjust the trajectory were successfully uploaded Monday evening; further commands will be uplinked on Thursday evening. The spacecraft will perform two manoeuvres, one on Wednesday morning and the second on Saturday morning. The effect of the two ‘dog-leg’ burns will be to bring the orbiter to a distance of 180 km from the comet and to reproduce the orbiter-comet geometry of the first contact. We should therefore not expect further news from Philae for the rest of this week. With a second short contact on Sunday engineers have confirmed that Philae is healthy and capable of doing science. Now they must re-arrange Rosetta’s orbit and re-establish regular communications to get that science started. After more than six months of silence after its bouncing landing on Comet 67P/C-G, Rosetta’s Philae comet lander has awakened and resumed communications with the science team. More details here. The data they have so far received, which is still being analyzed, suggests that the lander has awakened previously and gathered data at that time. More to come! Cool image time! The Rosetta science team has spent much effort trying to locate Philae, which attempted to land on Comet 67P/C-G in November. 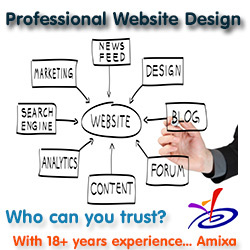 The image on the right shows what they think is their best candidate, the bright feature in the center. It was not there prior to Philae’s landing attempt. Because there are many uncertainties, however, this might not be Philae. 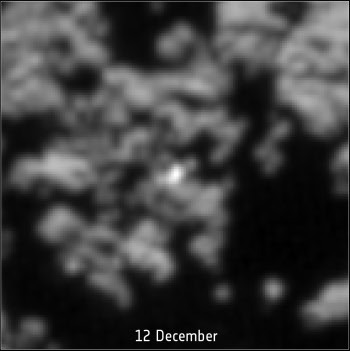 The other possibility of further refining Philae’s location would come if the lander were to receive enough power to wake-up from its hibernation and resume its scientific study of 67P/C-G. Then, CONSERT could be used to perform additional ranging measurements and significantly reduce the uncertainties on the lander’s location. At the moment, Philae is still in hibernation, but the mission team remain hopeful that, as the comet moves closer to the Sun along its orbit, the lander will receive enough power in the coming weeks or months to wake up and transmit a signal to Rosetta. Data collected by both Rosetta and Philae has confirmed that Comet 67P/C-G does not have a significant magnetic field. The data review also found that Philae touched the surface four times, not three, during its unintended bouncing descent. Because of the problems Rosetta experienced during its last close fly-by of Comet 67P/C-G the engineering team has worked out a new approach strategy for future observations. Essentially, they are postponing any close fly-bys for the near future. Instead, they will observe from farther away, while reassessing the situation and planing for later opportunities. Meanwhile, on April 12 the next opportunity to listen for Philae begins. 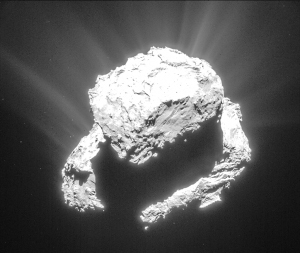 After eight days of sending signals, listening for Philae, and getting no response, Rosetta has ceased its effort. “It was a very early attempt; we will repeat this process until we receive a response from Philae,” says DLR Project Manager Stephan Ulamec. “We have to be patient.” On 20 March 2015 at 05:00 CET, the communication unit on the Rosetta orbiter was switched off. Now, the DLR team is calculating when the next favourable alignment between the orbiter and the lander will occur, and will then listen again for a signal from Philae. The next chance to receive a signal from the lander is expected to occur during the first half of April. They always knew that it was unlikely for the lander to come alive this soon, but they tried anyway. The odds improve, however, in the coming months. Rosetta has snapped a new image of Comet 67P/C-G’s smaller lobe that not only shows the increased activity around the nucleus but captures areas of the comet that had formally been in darkness. The image also includes the region where engineers think Philae landed, which I think is the area just below the brightest flat area in the center of the lobe. That this area is now in daylight is why engineers are hopeful that Philae might soon wake up. Beginning on Thursday Rosetta engineers will start searching for a signal from their lander Philae, hidden somewhere on the surface of Comet 67P/C-G. The likelihood of getting an answer this soon is not high, but the lander is now getting about twice as much sunlight as it did when it landed in November. There is a chance it will warm up enough and get enough stored power to come to life. Analysis of new data from Rosetta has still failed to locate Philae, though engineers are confident that sometime in May/June the sun will begin to charge its batteries so it turn back on and tell us where it is.